This home truly has it ALL!! 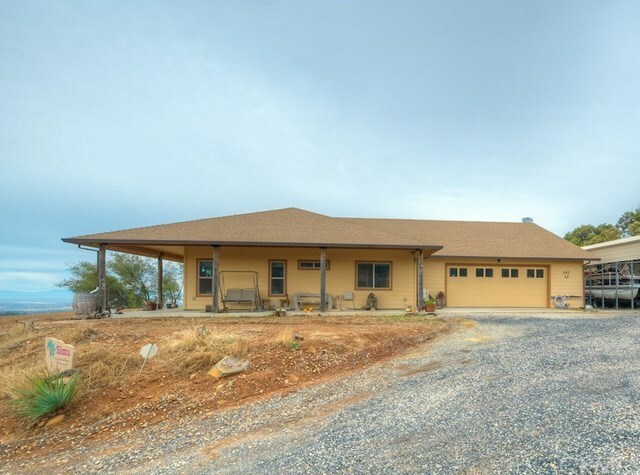 Custom, single owner home built by Better Builders, one of Orovilleâs premier home builders, in 2012 on 5.03 acres. Home has 2 bedrooms, 2 bathrooms and a spacious office. Some of the amazing features of this home include the large open floor plan with high ceilings, stained concrete flooring throughout home, beautiful ceiling fans (9 of them) and large windows looking out with an amazing view of the Sacramento Valley. Sit in the hot tub on the large wrap around porch and enjoy the sunset. Gourmet kitchen has granite countertops with island, knotty alder cabinets, antler pulls and knobs, open shelving, large pantry, recessed lighting, and GE Profile energy efficient stainless steel appliances. The master bedroom has an ensuite bathroom with dual vanity sink, walk in Steam shower, condensation sensors and bathroom heaters. In the large 3+ tandem car garage with shop is a sauna for those cold winter nights. 24âx46â RV carport and hookups with Water/Electricity/Sewer Home also includes an indoor fire suppression system, backup Generac generator and automated electric panel. Roof is fire resistant and attic fans spark resistant. Tankless, recirculating hot water heater. 31âx41â shop with three roll up doors. Shop is insulated, paneled, has 2 industrial ceiling fans, air compressor, and woodworkers dust purifier. I could go on and on, there is so much here. Make an appointment today to come see this beauty for yourself !